See the Feds have decided that there is no regulatory issues over CAT's buy out of Bucyrus International, soon the whole world will be baby Sh1t Yellow, wonder if that will be a culture clash, building walking draglines is akin to ship building at times rather than automotive assembly like a lot of CAT products. I don't see this as a bad thing Kevin. It might just save the old O&K line from being turned into garbage, and make some improvements to BIs lineup as well. I know its the way of big business to build up these huge monoliths Brian but I like to see some diversity, I would think there is very little that CAT can buy now without falling foul of some anti trust laws, I am glad that O&K will be welcomed into the fold, the Germans will teach them how to make decent Hydraulic shovels at least. Wonder what they will get rid of when the smoke clears, trucks I would think but yellow RH 200's doesn't bear thinking about! I dunno Kevin, I think I'd rather see yellow RHs, rather than the disgusting purple and white they have on them now. You are right though, I don't think Cat will be able to buy much more without running afoul of the regulatory agencies. With any luck, they can use their support network to a real advantage here. I think the next big thing we will see will be a buyout of P&H, or possibly Joy as a whole. The big question there is, what colour will they be? I can see three real possibilities, two of which, I think would work fine. The third....not so much. 3. Liebherr (not so much) ??? I´m really looking forward to see what kind of design the RHs will have. I just hope Cat will keep the development of the RHs here in Germany. and the third I am going to keep quiet on for now, but it's not Liebherr. Brian I wonder if John Deere could be intersted? Years ago they were going to step up and make big machines but a recession prevented them. Or perhaps one of the Russian or far east companies would take a punt, perhaps China, loads of cash about and P & H are selling shovels to the chinese like hot cakes. Good topic though. I dunno Kevin, I think I'd rather see yellow RHs, rather than the disgusting purple and white they have on them now. From a merely visual perspective, I can't recall who did this rendering originally but it was done a numbers of years before the merger was announced. 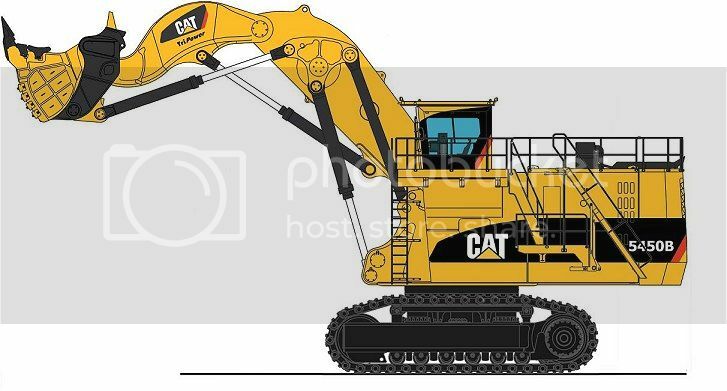 A proposed CAT version of the RH340. you have forgotten Belaz with the trucks and Taiyuan Heavy Industry with the big mining robe shovels from china. there are also some companies who produce trucks in china like ttm , xcmg and so on.